Balzan's Steve Pisani is tackled by Duane Bonnici. Photo: Jonathan Borg. 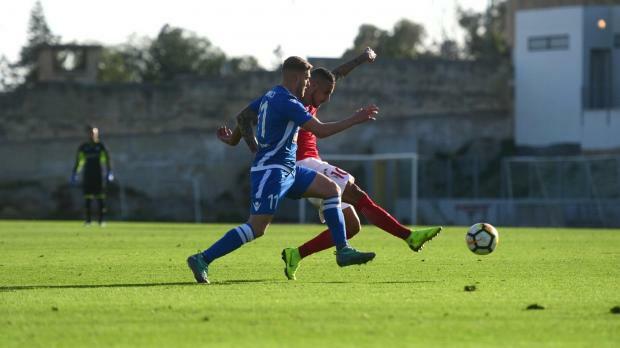 Balzan, under the charge of new coach Jacques Scerri, dropped more precious points as they could not go beyond a goalless draw to Mosta at the Hibs Stadium. The first half produced few scoring opportunities with the best chance coming after only five minutes of play. Milos Lepovic sent a dangerous cross inside the Mosta area but Andrija Majdevac and Alfred Effiong failed to make contact with the ball and Andreas Vella did well to block. The boys in red had to wait until three minutes from the end of the first half to threaten again. Ivan Bozovic dribbled a number of players before serving Majdevac who was quick to pass the ball to Kadu. The Brazilian served Effiong who crossed the ball towards Uros Ljubomirac who however, fired over from close in. On the restart, Balzan stepped up the pressure and Majdevac was unlucky to hit the crossbar with a header from close range, on 52 minutes, following a cross by Kadu, with Rafael Morisco clearing the ball into a corner. On 76 minutes, Balzan threatened with a cross by Cadu for Majdevac on the right and off the latter’s assist, substitute Lydon Micallef had a shot from close range partially saved by the goalkeeper with Rafael Morisco clearing the ball into safety. In the remaining minutes, the Blues controlled their opponents well to take home another vital point. Balzan midfielder Kadu was voted as the BOV Player of the Match.